Vitiligo does not look appealing, indeed, but you should never ever feel down for those nasty patches on your skin. In fact, there are tons of people who are quite proud of their white patches and do not bother covering them up. However, if you still want to look flawless, why even worry as there are ways to camouflage vitiligo with makeup? 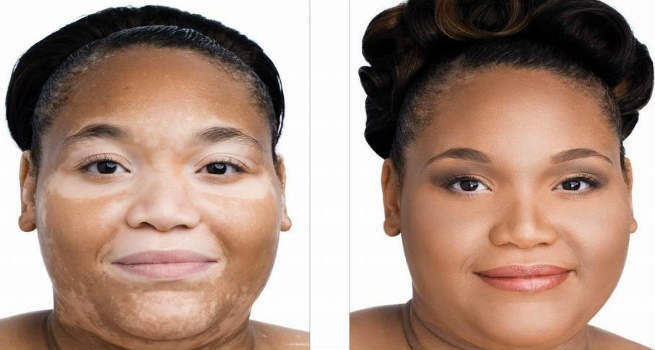 Yes, all you need to embrace the power of makeup to conceal vitiligo successfully. We give you 7 simple steps in this article. Vitiligo is a skin disease where you start developing light or white patches on your skin as a result of pigment (melanin) loss. It is typically caused by inactivity or destruction of the melanocyte cells. Vitiligo is an autoimmune disorder that needs extended periods of treatment to fade away completely. However, while battling the disorder with medicines or home remedies, you can also opt for makeup as instant and temporary solutions. But it is essential not to lose self-confidence in any condition if you have visible patches on your face or hands. The key to concealing vitiligo with makeup is finding the perfect shade of foundation. Make sure that the shade of your chosen foundation is closest to your actual skin tone or just one shade darker. There are many opaque foundations from brands like Microskin, ColorTradition, and Dermablend, which are specifically made for skin afflicted with vitiligo. The ingredients used in such foundations are hypoallergenic and do not aggravate the skin condition. If you do not find the right kind of specialized foundations, go for a regular full coverage one (water-based or cream-based depending on your skin type). 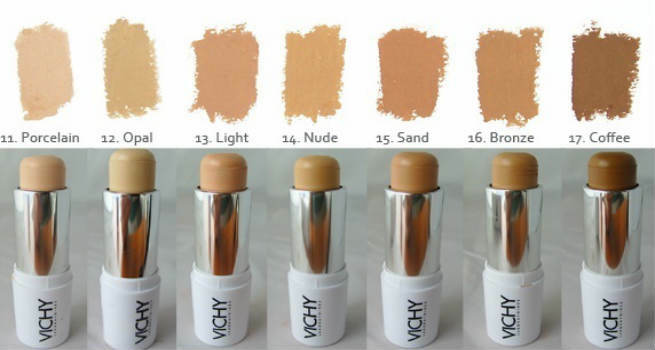 Vichy has some amazing high coverage foundations that go with a variety of skin tones and have worked for many women with vitiligo. Once you are done with the selection of foundation, start with the most basic step i.e. preparing your skin for the makeup. Cleanse the skin well with a mild cleanser (a herbal one is even better) that suits your skin and moisturize it thoroughly with a high-quality moisturizing cream or lotion. Apply a primer all over the clean and moisturized skin to allow for easy blending and absorption of the foundation. Always try to use a moisturizer that provides average to high sun protection along with intensive moisturization. A moisturizer with at least SPF 20 is a good choice to start with. Now, as your skin is ready to use makeup, start with concealing the white patches carefully. You must have picked a concealer that is a shade darker than your original skin tone. Make sure that you apply it on the patches in small dots and blend well by moving your fingers in circular motions. After that, top the concealer with the foundation you picked. Be careful with its application as you need to follow a simple trick at this step. First, apply it precisely on the white patches and keep blending until they look even-toned. Once done, dot the foundation on the remaining part of your face and blend thoroughly to get a uniform skin tone. Let the makeup dry for about five minutes. Then, check the shade of your skin and apply another coat of foundation if the need be. You can apply foundation in multiple thin coats. Start from the centers of the white patches and work outwards as you blend it with your fingertips. Now, it is time to seal the makeup to ensure that the white patches stay hidden for a long period of time. For this, dust some loose translucent powder all over your facial skin. It helps reduce unwanted shine by absorbing the excess oil. It also helps in evening out the skin tone more efficiently. Press the powder well with a puff and then brush off the excess amount. After creating an even skin tone, it is time to get a more natural look with the help of a bronzer. Choose a product that is one shade darker than your real skin color in order to emulate a beautiful sun-kissed glow. Apply it to the forehead, tip of the nose, and cheekbones until you get an illusion of a darker skin tone. As you are done with the face makeup, focus on the eyes and lips now. Highlight your eyes with your favorite kohl pencil and fill your lips with a striking lip color. This will draw the attention away from your skin and take it onto the eyes and the lips. However, keep your eye and lip makeup compatible with the makeup of rest of your face so that you achieve an absolutely natural appearance. Finally, it is essential to keep the makeup in place by following all possible means so that the white vitiligo patches do not end up getting revealed after some time. Since you have used so many layers of makeup, spritz on a fixing spray all over the makeup to set it and prevent it from smudging. That’s it! You are all set to go out and rock the world! Stay assured that no one will even understand that you have white patches underneath that layers of makeup. Just make sure to use waterproof makeup products if you tend to sweat a lot. Also, it is important to remove the makeup in the end of the day.